Work has begun in ernest and after just a couple of days, the heat and humidity are taking their toll. Our energy level drains early in the day and after dinner conversations are limited as the volunteers retreat to their rooms to sleep and air conditioning. I am a little accustomed, but never comfortable, with the outpouring of gratitude from our hosts throughout the years but the Dominican Sisters, Nueva Valencia and Guimaras have really extended themselves in opening their arms to us. From the welcoming sign at the port upon arrival to all the food that is prepared for us and the opening ceremony, we have been treated like royalty, and our work has hardly begun! The sisters have set up a good patient flow but, as always, what the local entities want to see happen and what our capabilities are simply do not coincide. There are far too many patients that can be seen in 3 days let alone a single day! As much as we don't like to, we set up a secondary triage and a couple of nurses syphon off the easier patients, evaluate them and if they don't need anything more than medication for simple pain or cold symptoms we treat and street. This allows the doctors to see the heavier patients and the team to see more patients. We are doing a lot of referrals, about 15 our first day, over 30 our second day. I don't know if it is a cluster, but we referred about 6 patients for chest/neck lumps and masses. Very concerning and is something that needs to be looked at. The other referral issue are pterygiums, blister-like growths on the eyes seen mainly on the fishermen who are out on the water all day contending with the glaring sun. One of our partners, Direct Relief International happened to have polarized sunglasses and we were able to bring 2 cases with us. Between the referrals for pterygiums removals and the glasses, we are making some fishermen very happy! Referrals are being handled by Sr. Gemma, sweet, unassuming Sr. Gemma who has the will of a freight train and a web of connections. This will greatly expedite tests at a much lower cost because, after all, who can say no to such a sweet little nun? We have a REALLY robust dental component this year as well. Dr. Jeffry and Dr. Campos worked hard to bring the best possible care to Guimaras and the set up looks almost like a real dental office! The lounging chairs for patients are a far cry from last year when patients sat on a rocking chair and rocks were placed under the rockers to brace the chair. With them, the dentists also brought a suitcase sized air compressor/suction machine and a cavitor to remove plaque via ultrasound. Sometimes God has other plans. Plans we don't like, don't agree with and or unhappy about. The purpose of the plans may never be known to us but we have have faith and trust in Him and what he plans for us. In December, the board met and voted to reschedule our January 2015 trip to the Philippines. The decision was uncomfortable at best knowing that many people in the Philippines, most notably local entities in Culasi on the island of Panay and the Dominican sisters in Nueva Valencia on Guimaras, had been planning for, and anticipating our arrival. We could not accommodate the issues that had arisen and so, instead of bringing a team that was not able to perform to the capabilities that are expected of us, the Board opted to reschedule the mission. Our new dates are posted on our Missions page as is all the information for the trip. Check out the dates and consider joining us. Many people wonder how they can help with a mission: they think to themselves - I don't really have any money to give, and I am not in the medical field - what can I do? Do I say great! wonderful! awesome! amazing! inspiring! ; when we worked with so many people in need? When every child we treated had scabies and worms? It was two weeks of many challenges, limited resources and a greater understanding of what the poor in Peru are up against when it comes to receiving medical care. Our days were long and if we weren't seeing patients, logistical issues were never ending. I don't believe in coincidence. I don't believe in chance. I don't believe that people are brought into our lives "just because"
This blog is written by Nikki Tamayo. She worked with us everyday for two weeks without fail. Since our departure, she has been busy following up on two children on our behalf. This means getting the children to cities 2-4 hours away, making sure they have the medication that is presecribed and that the children are taking the medicine. This job of a case manager had become far more complicated than what was anticipated. I asked her to write for us and below is her story, in her words, unedited. but suddenly what come in my mind that my family is safe my 2daughter is safe..
after a week uncle MATT RILEY told me about the plan of the holy rosary medical mission international that they are going to have a medical mission in my town that was terribly affected of Yolanda...I volunteer to do anything that can help the group even in a simpliest way..First day I was a translator w/ the pharmacist KAY YAMAGATA counting those medicine forwarded by the doctor for their patient is really a tough job wheew!!! !but it gives me knowledge on how every medicine works. Then the next few days I was promoted as a dentist assistant of DR. GERALD JEFFREY..
hey dr..what do you need?? everytime theres a patient sitting in his rocking chair (that was converted as a "dental chair")complaining about what was wrong with their teeth..
_dr.jeff; ok nikki the light..mirror,(if need extraction) lets give him/her a shots ( reffering to injection w/ anesthesia) 2x2,cups,water,meds,ice packs,toothbrush,floss,.. I have seen all the effort and all the hard work that the mission give to my people..they don't work for their job but they work their job w/ the heart. the best thing they bring with them..my heart melt seeing how CRIS give the guy with the club foot a very big help for him to stand comfortably...a thumbs up on how AILEEN lead the group..and ther's LYNN a hardworking nurse even shes tired she even smile all the time sometimes I can heard her laughing and always love to eat.dr. jeff silent but a good teacher.kay with her age she's so cool and amazing she always make sure every moment has a souvenir using her camera..dr. ADUCAYEN a lovely Filipina dr. at first I thought she was s strict one but noooo she was so lovely and soooo sweet, KUYA ED' I know him as a VERY rich man..hahaha because hes the treasurer/banker of the group..a super funny lolo ED ,,,'always wear a stethoscope and raom around while checking all the team on how they are doing if they need anything,,,as in anything just name it..right kuya ed?and gorgeous ANNE shes a teen ager but woundeful friendly,w/ a sense of responsibility and I also know her as adventure lover..UNCLE MATTt..oh yes uncle matt hes the one who suggest that during typhoon he will take care of the kidz because our house was made of light materials and i trust him my children's safety without any doubt and did not regret my decision..JUN from up hes so flexible like he can do anything,,(its obvious hes a adventurer from UP where uncle matt teach) kuya JOMAR..the driver despite of the busy schedule he always wear his smile.and ERIC the peace corp volunteer a salute to you peace corp..a good friend and a peoples servant whose in need..
as what i have said the group doesn't just do their work they work w/ a heart before they leave they leave me the un finish patient that they have,the patient that really need their help like EMILYN ERAGA the 3 yr old girl that lives in mountainous area of culasi both parent are jobless and had a 4 more siblings and cant even afford to buy food because of poverty,she has a patent uracus it has a same feature of umbilical cord hernia..she was taken to Iloilo city many times for her checkup and now i am scheduling the surgery for her..prayers will help her survive everything and whatever trials that comes in her life..
Genliza with her Grandmother and a portion of her medication regimen. and GENLIZA MAE DARADAR 14 years old stop schooling because of her health condition.. after having all the test in Iloilo and see a pediatric heart cardiologist she was diagnose w/ a rheumatic heart diseass..and now shes taking lots of medicine for her medication including her maintenance..she was raised by her grand parents and both parents die has 2 more siblings that live w/ her aunt miles away from her..and even her grand parents cant afford medication and the grandfather do some knives that we called a "bolo" to earn a living. giving these kidz a hope is a lifetime UTANG N LOOB from the medical mission team..and even ME was included w/ these kidz...thanking all the team that was given me all the opportunity that you guys have"
Our medical mission started simply enough: to provide medical care but it has grown far beyond our expectations and prayers. Matt Riley, our logisitician for the Philippines has wrapped up his teaching in the Philippines, has returned home and is already working at Holy Rosary School. In addition to his teaching at the university on the island of Panay, he, in conjunction with Nikki, our case manager, and a multitude of others, have continued to provide follow up care for a couple of difficult patients that we saw during our work. There has been an ever widening web of love, support and caring, something that none of us could have foreseen. We continue to support Ginliza, a 15 year-old with a heart problem that does not allow her to go to school. She is orphaned and lives with her elderly, frail grandmother and grandfather in a dirt floor shack. I learned yesterday that the grandmother has turned over guardianship to Nikki. This may seem harsh but the reality of getting Ginliza tested in a city four hours away required a guardian present and the multiple four-hour trips would be too difficult for the grandmother. A final lunch with the Dominican Sisters before Matt heads home to the United States. Matt made what was too be a simple courtesy call on the Dominican Sisters in Iloilo. The introduction resulted in a letter of invitation to assist our team's entrance into the country. And an historical paper to be written by Matt to assist the convent foundress on the path to sainthood at the request of the sisters and Rome. And the introduction of Ginliza to the sisters and the convent. And an invitation to Ginliza to live with them in their orphanage where she will be cared for and receive an education. And the discovery that one of the sisters was a trauma nurse in the United States, someone that can recognize any medical complications that might arise. We ask for fervent prayer for Ginliza, for healing and health; for prayers of thanksgiving to the Dominican Sisters in Iloilo and for any intentions that they might have and finally, in thanksgiving to everyone that has come into this young woman's life and has supported her journey. Nikki walks village to village on the island of Batalban looking for children with cleft palates. Nikki Update: The dance continues. In her multiple trips to Iloilo with two children for testing on our behalf, she became acquainted with Larry of Operation NewFace, a cleft palate organization. He has now hired Nikki to go out into the countryside and islands of Antique province to look for children with cleft palates. Nikki has also been accepted into a midwife program and will start in June. Tuition is being paid for by family and HRIMM team members. We saw 1903 patients over the course of eight days. We referred some on for cataract surgery, others to the hospital for lab work or xrays and several young children into the health care system for more medical attention. We gave away over $17,000 in medications and $2,000 in supplies. Dentistry in Culasi. Be flexible, innovative and above all trust in the Lord and let Mother Mary guide your hands. This was my mantra. Fifteen senior dental student were to show up for two days and we would perform cleanings and simple extractions for a community without a dentist for more than two years. At the last minute this was canceled by their dean In spite of the hard work of Matt Riley and Aileen Hayes. We had gathered surgical supplies, medications, hygiene instruments and about two thousand brushes and floss. We then decided to set up a dental rocking chair with rocks to hold it back and pillows to seat patients, children through adults. Shop was set up for cleaning and minor extractions. After a few cases it became evident that major extractions would be the main procedure. SUGAR, SUGAR and Coke seem to be in their mouths most of the time. A six year molar was lucky to last for six years. Flossing and tooth brushing was not commonly used. Most mouths had predominantly shells of teeth or roots of teeth covered with plaque colored black. Patients were given instruction on the common foods to avoid and how teeth should be cared for. All received a brush and floss. Patients in pain or had retained baby teeth had them removed. About 35 were treated a day and 60 or so triaged and dismissed some of which were seen the next day. University Instructor or NGO Logistician? You Decide! The following was written by Matt Riley who handled all of our in-country logistics. It was because of him our trip went so well. Thank you for your time and effort Matt! The last 9 days have been a whirlwind of activity. There is no doubt that this effort has paid massive dividends and I have seen it every day in the smiles and the polite nods of gratitude that I have received from the people of Culasi. Having first come to the town of Mt. Madja-as 34 years ago and being very familiar with the people and the place, I now feel like I have completely shared it with the members of HRIMM. It has been fantastic to sit back and watch the interaction between my good friends from Antioch and my good friends from Culasi. The people to people connection here is significant. So is the medical care. My Kinaray-a language skills have gotten a definite boost, as lacking any real medical care abilities; I have served mainly as a translator. Most of the time this was not a problem and I was able to communicate to the team member I was working with just what the patients problems were. I am of course not a native speaker, and deferred to Jun Ramirez from the University of the Philippines Visayas when I knew that I would have difficulty in explaining the nuances of both the patients problems and the team members instructions. Jun was amazing as was the other UPV member of the team, Joemar Cagampang. Eric Steiner, a Peace Corps Response Volunteer on loan to us from the Provincial Risk Reduction Coordinating Agency in the Provincial capital of San Jose, was likewise a big help, working closely with the pharmacy people and helping them stay organized. I have made a lot of new friends in the last couple of weeks, and thus my life has been significantly enriched. I hope that we can do this again next year. Our follow up for about a dozen patients will continue in the capable hands of Nikki Tamayo, my Goddaughter from Culasi who quickly became a valued member of the dentistry staff and Dr. Jefferies assistant. She is making sure that patients who were referred to a local surgeon or who were still waiting for prescriptions to be filled receive the help they need. I will also be back in Culasi in a couple of weeks and will begin to sow the seeds for another HRIMM visit!!! 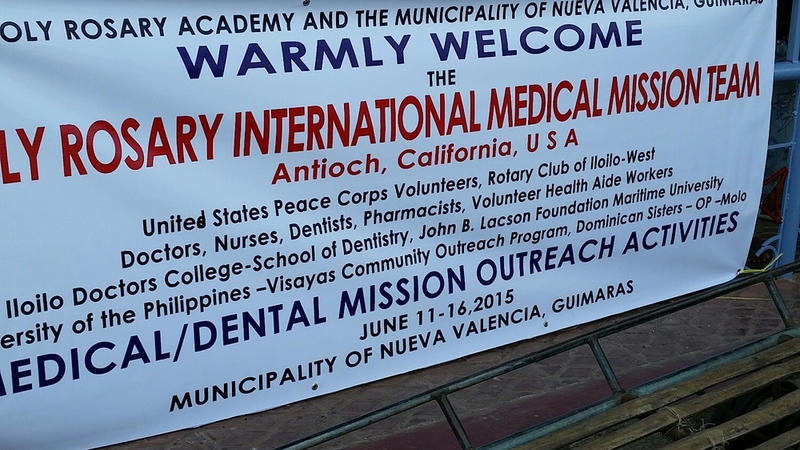 The medical problems the team witnessed are substantial, and plans are underway for continued support by working with Iloilo City-based Rotary clubs and with the Culasi District Hospital. I will be home in late March and look forward to seeing the team again, and reliving our shared experience. Our work ended a day early, We were to go to a small island for the last day but the weather and wind have been too unpredictable and the ocean too choppy to risk a 15 minute crossing. We were to spend the night on a larger island for a two-day medical outreach but that also was cancelled earlier in the trip. The boats of transport are called pump boats, long narrow boats with bamboo pontoons along each side and a motor. Not for the queasy under any circumstances but add a choppy sea and the risk is not something to be taken lightly. It is hard to believe our work is finished. 200+ patients a day, our sole dentist has extracted close to 100 teeth in a back-breaking marathon where patients sat in a rocking chair propped back by rocks under the gliders. Dr. Jeffry not once complained; he was the first to start, the last to finish and often took a quick lunch without quite leaving the patient's side. Dr. Jeffry is a man with vision, he immediately saw his work as a finger-in-the-dyke and is looking at issues for a long-term resolutions to the cycle of the horrible tooth decay here on Panay. Rotary International, MedShare and the Culasi District Hospital have all been identified and engaged as necessary for a successful outcome. If we had a volunteer of the year award, he would certainly win it. We saw so much, so many stories. A young mother of 4 came down from the mountain to see us. Her complaint of dizziness was very common but when asked when it started her answer was "Friday". Not a "long time" or "2 weeks ago" but "Friday". Very unusual. After some digging, it was realized her husband was "scada", a sugar plantation worker but was not sending any money home. We sent her to the market with Jun to shop for groceries. When she learned of what was being done for her, she broke down sobbing and took us with her. We did see more wounds than expected, open sores, lesions, wounds needing debridement, abscesses, mystery lumps, wounds with bugs embedded. Illnesses....pneumonia, ectopic pregnancy, cataracts, a woman who had a child with Down's Syndrome who did not know what was wrong with her child... so many stories, so much heartbreak, so much love, dignity and kindness. Can we talk about dignity for a moment? The majority of people we treated were impoverished. A complaint of "dizziness" meant different things depending on where you are from. If someone from the mountains complained of dizziness, it indicated hunger. Dizziness from the city indicated stress. Little we could do for either but encourage fluids, provide vitamins for malnourished children or provide instructions on stretching or relaxation. We do not have the means to address hunger at the level presented and so we offer pathetic diagnoses of dehydration or stress. Regardless of where the patient came from, they came to us in clean, washed clothes. The vast majority seemed to have just bathed. They did not just come to us for medical care, they presented themselves to us. Scant resources were used so that in the end, the medical workers were grungier than any patient that came to us. Tonight is our last night in Culasi. We will continue to write about this trip, in particular about those that we met while here. An amazing trip, an amazing country and, most importantly, amazing people. 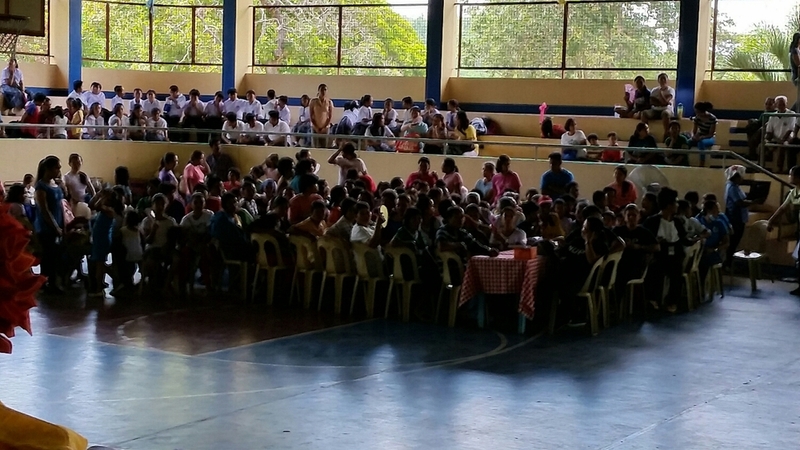 We have given away all 250 pairs of eye glasses and the five pairs of sunglasses that we brought. Once people realize we have, them, there is an epidemic of blurred vision. In order to prioritize, we established that no one under 50 gets a pair and they have to be referred by a physician. Despite this, it does not stop us from seeing some younger women with reading glasses walking around with the size tag still on the frames. Below is a perspective written by Mike Hayes. He is not with us this trip but was active in collecting glasses for this trip and ran the glasses program in Peru, 2013. When I inherited the eyeglass portion of the mission I didn't realize how much I would learn about eyeglasses. I met an optician, Adrian, through Fr Roberto. Turns out he has his own non profit eye clinics he sets up around the world for people in need of glasses! He taught me how to read the glasses lens power with a lensometer. What fun! Who would of thought I would be doing this? Anyway, when I finally packed up the collected reading glasses it was difficult to say goodbye to them. The medical system in the Philippines is ridiculously simple: if you don't pay, you don't receive treatment. Nor do you go home. End of story. Hospitals are organized as primary, seen at the local level, secondary, seen at the regional level and tertiary, the big city hospitals that are at the equivalent of what we are used to. If a patient is admitted to the hospital, families are given a list of necessary supplies and medications that need to be purchased. Families also are responsible for bringing in food for the patients. No family? No supplies or food. Simple. If the patient cannot afford the supplies or to pay the room fee, they sign a promissory note but here is the kicker: patients are not discharged until the promissory note has been paid! The patient remains in the hospital until the bill has been paid with a guard posted to prevent the patient from leaving and the daily fees continue to compile! In these instances the hospital becomes a debtors jail of sorts and patients do occasionally escape. Costs are ridiculously inexpensive but a simple blood test costing $1.50 can easily eat up an entire day's salary, not to mention the loss of income when a day is taken to go to the hospital. An earlier blog mentioned that the local hospital in Culasi can perform CBCs on a daily basis and lipid panels and uric acids on Wednesdays. For anything else, potassium, sodium, bun, creatinine, etc., the patient gets the blood drawn at the hospital then transports it two hours away for processing and brings the results back to the ordering doctor. A blood draw, two hours on a bus, waiting for processing and a return to trip of two hours. All for lab work that can be done on a hand-carried machine here in the United States. There are no specialists; cardiologists, ENTs, gastroenterologists and even dentists are nonexistent in this region that serves 50,000 people. Access to care, as you can see is ridiculously difficult and when you do find a practitioner that can help you, they too are caught up in the same bureaucratic maze that severely limits their capabilities and visions as the patients they are trying to help. The system in our Americanized eyes is seriously flawed but this is their system, not ours and we must learn to work with the reality of what is available. We are at the half-way mark. We have not done any daily calculating but our numbers seem to be averaging 150 a day. An extremely respectable number for a group of our size. A 13 YEAR OLD BOY came to see us. He instantly drew lots of attention as he was no bigger than a 7 year old. First impression: the island is beautiful. The city of Kalbo was crowded with motorcycles and taxi cycles, motorcycles with a sidecar of sorts whereupon up to six people might be sitting in/standing on. They did not dissipate once outside of the city nor did the myriad of ways into which a family might fit into/onto one. Traffic slows only for cows, water buffalos and if the vehicle that is heading towards you is bigger than what you happened to be in. The countryside is picturesque with rice paddies stretched out across fields before being interrupted by the mountains. Houses are crammed along the roadsides and often have a small business or store in the front room or porch. They are sometimes made of stucco, others are made of wood, some sturdy, others a version of plywood. Hurricane damage is evident in some areas, clusters of neighborhoods are rubble, other neighborhoods will have just a few homes destroyed and then there are the homes that have one side of the house knocked off the foundation but, despite the angled floor, appears inhabited. The city of Culasi where we are staying appears in good shape but a lot of work has gone into cleaning and rebuilding. Our in-country logistics person, Matt Riley, has a niece who's home was destroyed and now her family of four are living in a one bedroom house with a single light bulb. Yet she is spending her days with us, working as hard as we are. Not having meds or supplies to sort the day of our arrival since our supplies were a no-show, we went to the local hospital to meet with Dr. Aguirre, the head of the facility. The meeting was productive and we were able to establish referral capabilities for labs and x-rays. A CBC is $1.50, xray, if I recall correctly, just a couple of dollars. On our way out of the hospital, we met a lab technician who provided me with specific information about what labs are available: CBCs can be done but just in the mornings. Cholesterol and triglycerides panels on Wednesday mornings. I waited for her to continue but there was no continuing. That is ALL the blood work this hospital could do. I asked about specific chemistry levels, so basic in any lab in the US: Sodium? Potassium? Kidney function tests? Liver tests? She never stopped shaking her head. If someone needs those labs, the blood is drawn at the hospital then a family member drives the blood 2 hours away for it to be processed, waits for the results and brings the results back. So hard to accept. We did go through the emergency room and sadly, there were no surprises: a couple of old beds, a curtain and a large oxygen tank. That was all. We were also able to meet an ophthalmologist in town who works in Culasi only on Saturdays. He does cataract surgeries at no cost and is also a general surgeon. We referred two patients to him yesterday: one for cataracts which turned out to be mild but needed reading glasses and a baby with an exposed umbilical hernia. HRIMM is covering the cost of both patients for about $60 total-that includes the glasses and operation!. I think we will be keeping this new friend busy! We saw lots of patients yesterday and not your typical head and back pain symptoms. A lot of these folks are sick/sickly or not thriving. Dr. Jeffries, our dentist is busy with patients and is extracting more than he expected. He has a student nurse working with him who is also translating. She apparently is a good fast learner and watching the two of them together you would have they had been teamed together for years! I am hoping to get other team members to blog so you get different voices and view points. Keep us in your prayers and also ask that it continue to NOT rain on us, we have been extremely fortunate as the weather has cooled and is blustery in the afternoons. We are almost out the door! Boxes are getting packed and sealed, the house is a mess and final details are being ironed out.